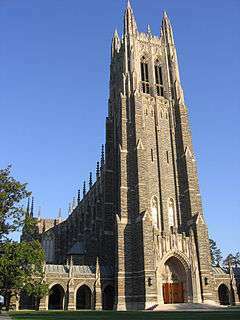 Duke University Press is an academic publisher of books and journals, and a unit of Duke University. It publishes approximately 120 books annually and more than 40 academic journals, as well as five electronic collections. The company publishes primarily in the humanities and social sciences but is also particularly well known for its mathematics journals. The company was founded in 1921 as Trinity College Press with William T. Laprade as its first director. Following a restructuring and expansion, the name was changed to "Duke University Press" in 1926 with William K. Boyd taking over as director. Duke is one of thirteen publishers to participate in the Knowledge Unlatched pilot, a global library consortium approach to funding open access books. Duke has provided four books for the Pilot Collection. ↑ "Inventory of the Duke University Press Reference Collection, 1922-ongoing". Rare Book, Manuscript, and Special Collections Library [online catalog]. Duke University Library. Retrieved 2010-04-11. ↑ "Duke University Press at the 2014 IFLA World Library and Information Congress". Duke University Press Log. This article is issued from Wikipedia - version of the 3/7/2015. The text is available under the Creative Commons Attribution/Share Alike but additional terms may apply for the media files.